“Life’s most persistent and urgent question is: what are you going to do for others?” I love this quote by Martin Luther King, Jr., because it so eloquently describes what nursing is all about. How lucky am I to be apart of a profession that, as I’m walking out to my car after a shift, my heart is bursting. Whether it be bursting with love, sadness or excitement- every single day when I leave work I feel alive. How many people can say that about their jobs? Healing and touching lives isn’t always easy- but it’s always worth it. My name is Rebecca Stanton. I had the privilege of graduating from the University of Maine’s nursing program in May 2016. I recently added BSN, RN next to my name and am starting my new journey as a Registered Nurse. I am currently attending Duke University Hospital’s Nurse Residency Program specializing in Neuroscience Intensive Care. I am writing today to share some of my experiences with you and reflect on the journey that got me here. I passionately lived out my four years at UMaine. 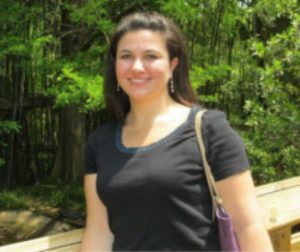 I was excited about the profession of nursing, about my university and was eager to discover what the future would bring for me post-graduation. On campus I served as the President of the Orono Student Nurses’ Association, Vice President of the Maine Student Nurses’ Association, Secretary of the All Maine Women Honors Society and attended multiple state and national nursing conventions. I also traveled abroad with other student nurses to provide medical care in impoverished areas of Belize. 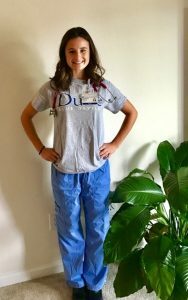 When I learned of Duke’s Nurse Residency program, my mind swarmed with excitement, hesitation and nerves. I knew what an amazing opportunity it would be but felt apprehension about leaving my family and friends in New England to move to North Carolina. Looking back now, committing to Duke and moving to NC was the best decision I could have made. Nurse Residency Programs are a new and fantastic opportunity for new graduate nurses. If you have a specialty you are passionate about, a residency program is the perfect bridge to transition you into that specialty. My program consists of a 12-week precepted orientation before transitioning into caring for patients independently. In addition to immersing myself full time in the unit, I also take certification classes. Once a month I take a residency class that is neurology-specific and filled with new research findings in neuroscience, evidence based practice research or general information on how to succeed as a new graduate nurse. After orientation, I will have the opportunity to increase my involvement on my unit or in the greater hospital by joining committees and boards. I feel that the University of Maine prepared me better than I could have imagined for this opportunity. The encouragement I received from my professors and mentors at UMaine is truly what got me here today. Without them, I would not have believed in my own potential or seen clearly all that a career in nursing has to offer. Like most nursing students beginning at the University of Maine, I started out wondering if this was the profession for me. With the help of the faculty and numerous friends in the program, it became increasingly clear that nursing is a wonderful field to become a part of. From the moment I started work as a nurse, I knew that I would look forward to coming to work each and every day! I began my professional career in September of 2011 at MidState Medical Center in Meriden, Connecticut, a small community hospital that is well known locally for patient care excellence. I began on a floor known as Pavilion D, the hospital’s Stroke and Medical Telemetry floor. The level of teamwork and welcoming to a new nurse such as myself was absolutely staggering. Every individual on the floor, whether a CNA, a RN or a MD, was involved in my orientation to the unit and how to care properly for the patient population. By the first week of December, I was told I am ready to practice on my own. However, the team was always there in routine and emergency situations, which was very much to the benefit of all the patients we cared for on a nightly basis. I learned many valuable lessons through my first year of nursing practice, and made several very close friends. All of which I intend to carry with me throughout the rest of my career. After a year and a half at MidState Medical Center, I received a compelling offer to work at Hartford Hospital’s Medical Intensive Care Unit, and currently continue to practice there. Stepping into a specialty opened many new doors for learning and career growth. I am excited to see what the future has to offer, and wish the best of luck to all students currently enrolled in the University of Maine program! You have chosen a great profession, and although there are challenges, don’t give up! Keep working, keep growing, and never stop learning! 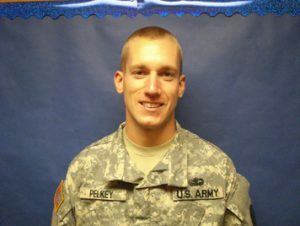 Spencer Pelkey, UMaine BSN class of 2012, was commissioned as a 2nd Lieutenant in the United States Army in May, 2012. 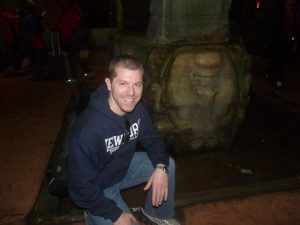 During his years as a UMaine nursing student, Spencer also served as a Cadet in the UMaine Army ROTC program where he benefitted from an outstanding military nursing learning experience in the Intensive Care Unit of Tripler Army Medical Center in Honolulu after his junior-year of the BSN program. Spencer visited us in Dunn Hall this summer (2012) while serving as a Gold Bar recruiter with the UMaine Army ROTC program. He passed the RN licensure exam in May 2012 and he is now on his way to a Basic Officer Leadership Course. Upon completion of that course, he will report to his duty station, the Dwight D. Eisenhower Medical Center, Fort Gordon, in Georgia. Spencer expects to go on for additional specialized nursing education in the U.S. Army after gaining experience at Eisenhower Medical Center. Spencer is from Millinocket, Maine and graduated from Sterns High School. His older brother has recently enlisted in the U.S. Army. The School of Nursing faculty and Spencer’s fellow students are proud of his UMaine and military accomplishments – and we are equally proud to know that U.S. Army troops will be well-served by a UMaine School of Nursing graduate. “My professional nursing career began June 7, 2010, at Mid Coast Hospital in Brunswick, Maine. As Maine’s only Magnet awarded community hospital, I knew I was in a great place. I felt privileged to be joining a well-versed team of colleagues, some with decades of experience. With my future goals to pursue a career in a specialty area on hold, I was looking forward to the opportunity to develop a vast array of skills on the Medical/Surgical unit. The first three months of my new graduate transition was spent providing direct patient care under the guidance and supervision of a few select preceptors. By the end of August, my Nursing Supervisor and colleagues gave me the reassurance I needed as they told me “Lynne, I think you’re ready to fly solo”. Flying solo I did, but not without my flock in the periphery. The first few weeks I spent on my own allowed me to realize that even after orientation had ended I was never alone. The endless support from my coworkers allowed me to practice autonomously, yet help was never far away. The greatest lesson I learned in my first year transition from student to professional nurse was that all nurses, regardless of experience, never have all the answers. Medicine and nursing practice is ever changing, and the most important notion to understand is that a quality nurse is not defined by their infinite knowledge, but by their resourcefulness and knowing where to turn to for further guidance. Nursing as an entity is a team effort. In June 2011, I celebrated the one year anniversary of my professional career. In reflecting on my journey I was pleased to feel as though I had experienced great joy and triumph during the most difficult year of transition. I cared for an array of patients with complex medical needs, each sharing a unique lesson of life and nursing that I will carry with me throughout my career. In addition to my work as a direct care nurse, I also serve on the Mid Coast Hospital Magnet Steering Committee, the Professional Practice Documentation Committee, and am proud to say I will be serving as a preceptor for one of UMaine’s most recent alumni during Mid Coast Hospital’s 2011 Nurse Residency pilot program”! 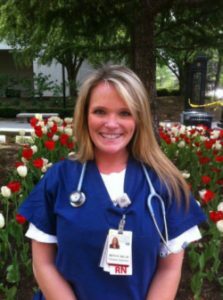 Brittany Hill (BSN 2010) recently sent an update from Washington, DC, to Dr. Ann Sossong, Associate Professor of Nursing. Brittany received the Clinical Excellence Award from Eastern Maine Medical Center when she graduated in May 2010. Brittany is now in Washington, DC, having been accepted into a highly competitive educational program in emergency nursing.